Book now a charter in May or June 2017 on GRAND BLEU VINTAGE (CNB 95') in Med and benefit from a 15% discount on the charter fee. Discount valid until 28th February. Grand Bleu Vintage is an exercise in elegance, comfort and impeccable hospitality. 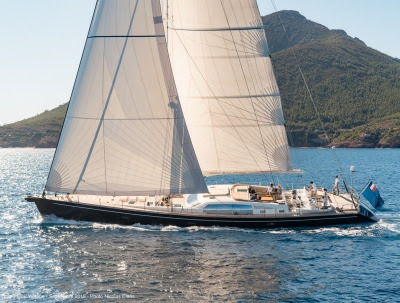 Designed by the renowned Philippe Briand and built by CNB Bordeaux, she exudes quality and performance in every situation. Whether under sail or at anchor guests will find Grand Bleu Vintage comfortable and luxurious. The deck salon offers guests the opportunity to relax and unwind in the warm breezes of the Mediterranean while sipping an aperitif before dinner or simply reading a great book. Guests have the choice to dine on deck or below in the light and airy salon. All cabins are ensuite with bathroom.